Price includes shipping within the U.K, U.S.A. and Western Europe. 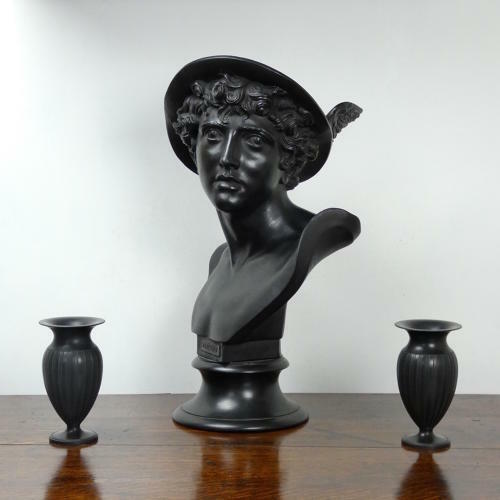 A very impressive, Wedgwood black basalt bust of Mercury. There are a number of impresssed marks on various parts of the bust. On the back of the shoulder of the bust it is marked 'WEDGWOOD' and then 'MADE IN ENGLAND' appears on the square section of the bust just above the socle. On the front of the square section the figure is named 'MERCURY' and the socle is also marked 'WEDGWOOD MADE IN ENGLAND'. Many of this type of bust were produced in the middle of the 19th century. This one is later, dating from c.1920 but it is an exceptionally good quality piece for its' period. It is well potted, has fine detail and it also has a good patina. There is a very small chip to the square section, just under the title 'MERCURY'. There is also an even smaller chip to the top of the socle. These very minor faults can be seen in the images. Other than this it is in excellent condition.